To say that Sir John Morgan's father's name was a bit of a mouthful is to put it mildly. There was a lot of character in Welsh names in the 15th century, but it could take an awful long time to actually say them. A name was rather like a family tree. Using a series of 'aps' ('son of') the lineage was proudly displayed, but was surely enough to test the patience of the most polite of readers or listeners. John's father, for instance, went by the name of Ieuan ap Morgan ap Llywelyn ap Morgan ap Llywelyn ap Ifor of Tredegar. "The descendants of Llywelyn ap Ifor, living in some form of house at Tredegar, decided that their name was to be that of the old family Christian name, the old royal name of Morganwg; the famous name of Morgan." John was created a Knight of the Holy Sepulchre (possibly c1448). He had visited the Holy Lands where the Crusades had been fought. At this time, pilgrimage was becoming a popular venture among noblemen. Rather like today's 'package holidays' it was entirely possible, for a price, to have everything arranged for you; from the transport, to the food, to the guide. Not all 'packages' were as attractive as they seemed; noblemen were advised to use Venetian ships or risk ending up at the bottom of the sea! The behaviour of certain noblemen on pilgrimage often left a lot to be desired. Fifteenth century graffiti was a problem and it was not particularly difficult to identify the culprits. We can only hope that Sir John did not follow the disrespectful trend of noblemen that chose to carve their family crest on the walls inside the Holy Sepulchre itself. Upon returning to Wales, Sir John cemented his fortune and influence, and helped guide the Morgans firmly back into the ascendancy, after the unfortunate aftermath of the Glyndwr rebellion. He married Jenet, the daughter and heiress of John David Matthew of Llandaff. The Matthew family were very influential and the match seems to have been a beneficial and successful one; ten children resulted from it. On 22 February 1476, Sir John was bound to the King in a bond of 300 marks which would only be cancelled if he appeared in chancery within three weeks of easter and did not leave London without the King's express permission; and, as stated by Ralph A Griffiths ('The Principality of Wales In The Later Middle Ages, 1972) "in the following June he entered into a bond of 500 marks with Duke Henry of Buckingham to ensure his good conduct in the lordship of Newport." Good conduct was the very last thing on Sir John's mind in 1485, when, following something of a Morgan tradition, in the footsteps of his ancestors Sir Morgan ap Maredudd and Llywelyn ap Morgan, he supported rebellion. An early supporter of Henry Tudor's claim to the throne of England, Sir John rallied to the Red Dragon Standard when Henry landed in Milford Haven in August 1485. It is likely that such a rich, influential and firm Tudor supporter, with such a reputation for competence on the battlefield (even if we only know this thanks to the flattering words of a paid poet) would have been present at the Battle of Bosworth Field on 22 August. History is full of 'what ifs'. What if Richard III had won the Battle of Bosworth Field? What sort of building would Tredegar House be today? Would it even exist? Fortunately for the Morgans, at last, one of their rebellions proved successful. 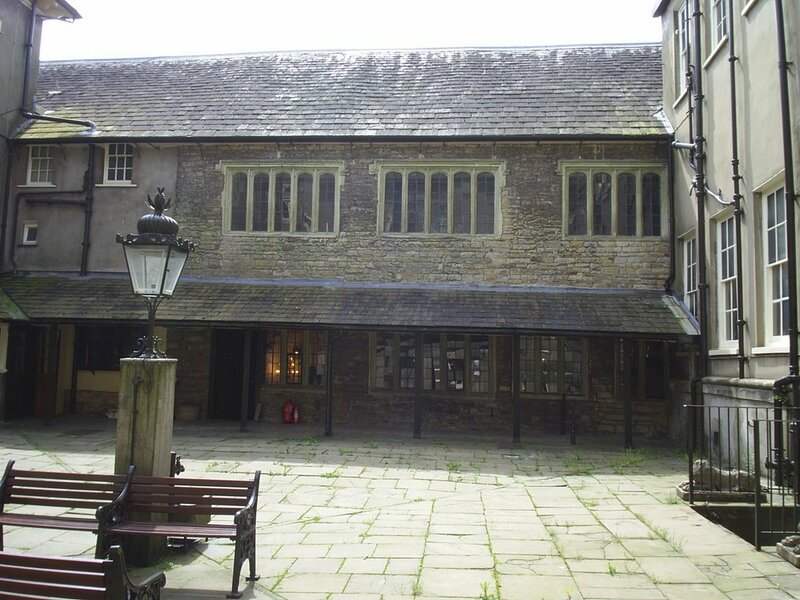 When Henry Tudor was crowned King Henry VII it was of great benefit to the Morgans of Tredegar. Sir John received reward for his early support almost immediately. 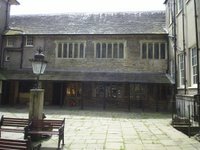 On 7 November 1485 he was appointed by the new king 'steward and receiver of Ebboth for life', granted the office of Sheriff of Wentloog and Newport, and was made Steward of the Machen Commote. His elevation to officer of the Tudor crown placed Sir John Morgan's influence and power at a new height. To better reflect this newly found status it is likely that, sometime after the Battle of Bosworth Field (perhaps c1490), he commissioned the building of a new house at Tredegar. A wing of Sir John's stone manor house still exists. It is now the oldest part of the present day Tredegar House. Walking around the much remodelled remains of Sir John Morgan's house at Tredegar today, it is tempting to picture a Falstaffian figure, being praised to the Heavens by his adoring bards (much as Dafydd ap Gwilym did for Ifor Hael), enjoying his new status, and all the while hoping that the crown would not catch up with his latest scheme to enrich himself at their expense. But, if we take c1490 as the date of the building of his new stone manor house, it is unlikely that Sir John enjoyed living there for very long. His will is dated 26 October 1491 and it is likely that he died soon after that, possibly in the following year. He was buried at St Woollos. His alabaster tomb was, according to Octavius Morgan, desecrated by Parliamentarian troops during the Civil War; only fragments of his effigy survive, but, even after centuries of damage by time and fate, the image is still recognisably Sir John Morgan of Tredegar; it shows a figure wearing the Lancastrian collar, with an unmistakable little paunch underneath his armour. He acted as Esquire to the body of King Henry VII and built Plas Machen after his lord gained the throne of England at Bosworth Field in 1485. The Morgans were rewarded and were allowed to purchase the manors of Bedwellty and Mynyddislwyn. They were rather unpromising lands back then, but the soil contained rich mineral deposits that added greatly to the fortune of future members of the Morgan family. Thomas married Elizabeth, daughter of Sir Roger Vaughan of Brecon, and many of their children were set up in estates of their own (the Morgans really were more of a clan than simply a family and had cadet branches all over South Wales), their children included: Rowland (who became sheriff in 1588), Reynold (of Llanfedw), John (of Bassaleg) and Edmund (of Bedwellty). Thomas's grandson, another Thomas, built Ruperra Castle in 1626. Just wondering about Plas Mechen. I am a Roberts from John Roberts who left Parish, Caernarvonshire, , Wales for America line. My great great great grandfather, Amos Roberts (WV--USA) married Sina Bainbridge whose mother was Sarah Morgan who has been traced back through the ancestors to Sir John Morgan. In putting together my ancestry I found your page and looked up Plas Mechen. I found a site saying that it was for sale, but found no dates. I am wondering what has happened to it? It would be wonderful for it to be restored. I do love your site on Tredegar House. It has given me great information on my ancestors. Given Sir John's friendship with Henry Tudor, do you know of any marriages between the Morgans and the Tudors at any time? All way back to Grandfather's line. "Llewellyn 1st AP Morgan of Tredegar & St. Clear"
I am Morgan and Proudly Carry last Name Morgan of my Ancestors Bloodlines. Thank you, keep up good work.